Like painting, caulking is one of those home improvement projects that people like to feel that they already know how to do. In reality, most people simply have never learned the correct way to apply caulk, and more often than not, the job ends up being a mess. If you learn a few simple steps, though, your caulk jobs will look like they've been done by a pro. The first step is to evaluate your project and choose the proper caulk for the job. There are a number of different caulks, colors, and dispensing methods from which to choose. Caulk typically comes in three varieties: latex, silicone, and butyl rubber. For dry areas, vinyl latex caulk works best. For wet areas, the nod goes to silicone caulk. For exterior jobs, butyl rubber works great. For interior home repair caulking projects, use either a latex caulk or silicone caulk. 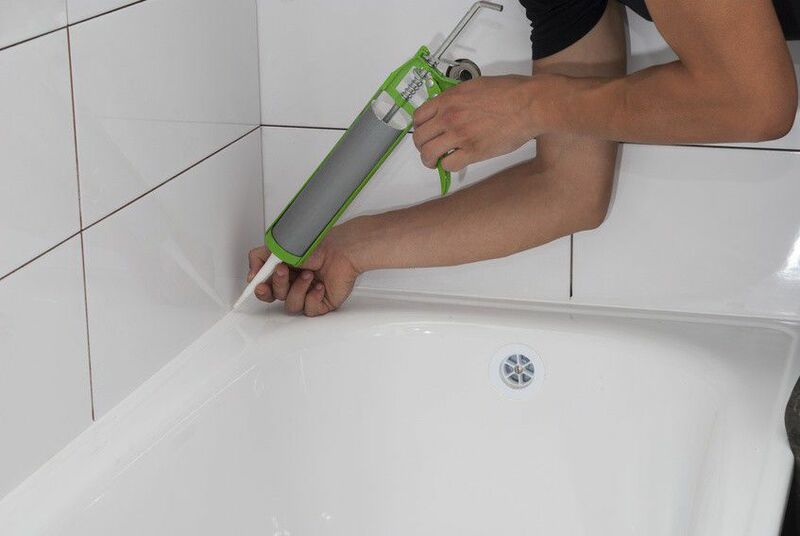 The type of caulk gun or dispensing tool you use is also an important decision. Caulks can be purchased in either squeeze tubes or in cartridges that are loaded into a caulk gun. The pros typically use cartridges and a smooth-action caulk gun, both to save money and achieve the best results. Use the razor scraper to get all the old stuck-on caulk off both adjoining surfaces, such as a ceramic tile wall and the lip of the tub or sink. Scrape the surfaces clean. Vacuum up the debris, and also vacuum the open joint. This is the secret to a professional looking caulk job and any amateur home repair enthusiast can do it. Without this step, you will end up with very wide caulk joints once you try to smooth the joint out after application. The use of tape to mask both edges of the joint allows you to set the width of the joint and protect the surrounding finish material from being smeared with caulk. Apply strips of blue painter's tape to mask off both surfaces at the point where you want the edge of the caulk bead to stop. Make sure the tape is straight and use long sections of tape, not short pieces. The joint will look best if you tape to create a fairly thinner joint, about 1/4 inch in total width. Press down firmly along the edge of the tape edging the caulk joint. The goal is to seal this edge so caulk cannot seep beneath it. This can be done with your fingernail to ensure a tight seal, or with a wooden popsicle or craft stick. Once the joint is cleaned out and masked, you're ready to caulk. Open the caulk tube by cutting the tip at a 45-degree angle and puncturing the inner seal with a long nail or wire. Many newer caulk guns have a built-in snipper to clip the tip of the caulk tube and puncture wires to break the inner seal. Apply the caulk at a 45-degree angle between horizontal and perpendicular. Make sure to squeeze hard enough to force the caulk fully into the joint. Draw the tip of the caulk tube along the length of the joint as you slowly squeeze the handle of the caulk gun, working at a speed that is slow and consistent. The smoother the initial application, the better the end results will be. The next step is to smooth the joint. Here's where the tape masking technique will make your job more successful. Without tape, smoothing the joint can leave you with smeared edges, but by using the tape masking technique, your caulk joint will be left with a clean, sharp edge. Wet your finger with either alcohol (for silicone caulk) or water (with latex caulk). Also, dampen a corner of a cloth rag with either water or alcohol, as appropriate. The alcohol or water will serve as a lubricant and thinning agent as you smooth the joint. Using firm pressure, smooth the caulk joint, working from one end to the other. As you finger becomes laden with excess caulk, wipe it off with the dampened rag and re-wet your finger. Continue the smoothing process until the entire taped section you're working on is finished. Tip: If you dislike the idea of getting caulk on your fingers, you can use a rounded craft stick (popsicle stick) instead of your finger to smooth the joint. Or, you can wear a tight-fitting latex glove while smoothing the caulk bead. Once the caulk joint is smoothed out, immediately remove the blue painter's tape used to mask the joint. Remove the tape away slowly, and pull it away from the joint at an angle, not toward the joint.